Essential oils (EO) are major products in the world economy. Citrus species (Rutaceae) EO, present in the pericarp of the fruit and leaves, provide raw material for a wide variety of industries such as resin products for paper and textiles, binders to manufacture insecticides, antiseptics, pharmaceuticals, perfumes and food. This study determines the chemical components monoterpenes, sesquiterpenes, plus limonene and linalool enantiomeric distribution of Citrus aurantium Lineu, Citrus sinensis (L.) Osbeck and Citrus reticulata Blanco EO, through gas chromatography coupled with mass spectrometry (GC/MS). All EO were acquired and collected in South and South- Central Brazil. Samples were obtained by steam distillation, hydrodistillation or cold pressing extraction. The results showed that limonene (39.5 to 92.7%) is the main component of the pericarp and linalool (14.2 to 24.8%) is the main component of the leaves. It was shown that the extraction method did not change this distribution. The (R)-(+)-limonene was 60 to 99% in all Citrus EO analyzed. The (R)-(-)-linalool was 59 to 64% in Citrus aurantium and (S)-(+)-linalool was 76 to 99% in Citrus sinensis and Citrus reticulata. 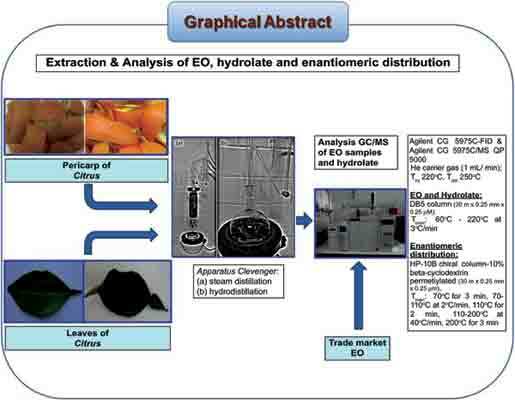 The hydrolate of Citrus aurantium (orange water) was also analyzed and presented as the main components nootkatone (17%), alpha-terpineol (10%), linalool (10%) with ee (R)-(-)-linalool, limonene (0.8%) with ee (R)-(+)-limonene. These results confirm the interesting quality of Citrus EO from Brazil, ensuring their applications in many industries, products categories, including medical applications owing their physiological and psychopharmacological properties, which show similarities with Citrus EO from other countries. Citrus, enantiomeric distribution, essential oil, hydrolate, limonene, linalool. Pharmaceutical Sciences Graduate Program, Federal University of Rio Grande Do Sul (UFRGS), Porto Alegre-RS, Brazil.